alaTest ha recogido y analizado 110 comentarios relacionados al producto SHARK NV681UK. En promedio, la calificación para este producto es 4.8/5, al ser comparado con la calificación 4.2/5 de otros productos en la categoria productos. Los commentarios acerca del diseño y el tamaño son por lo general positivas. La fiabilidad y la relación calidad-precio también se valora. Analizamos las valoraciones de los usuarios y los expertos, la edad del producto y demás factores. Comparado con otros productos el SHARK NV681UK recibe una alaScore™ global de 89/100 = calidad muy buena. I've had this cleaner for just over a week and I've never had one with the suction this good. I know my carpets are clean now. I love the removable cylinder, great on the stairs and in the car. After having a cordless vac it is refreshing to go back to a plug in. The Shark will get the job done without worrying if there's enough charge left. Assembles really easily. 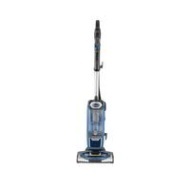 Performs well on both carpets and hard floors. A little on the heavy side. Quick and easy to convert from upright to hand held. Lightweight as well. First time I've had a shark and the suction is much better than my previous Dyson. I've give it 4 stars as it is quite heavy, could do with being slightly lighter. Would still recommend to anyone thinking of purchasing a shark. I bought this about a month ago and it's quite heavy not light like it says and also the roller gets stuck sometimes when you turn the carpet mode on!